Students during the Saraswati Puja celebration at Cotton University on February 10, 2019. Image by UB photos. Saraswati puja was celebrated amid much enthusiasm, festivity and religious fervour in Udalguri district of Assam by worshiping the goddess of knowledge, music, art and culture. All the schools,colleges and education institutions in Udalguri, Tangla, Kalaigaon, Rowta, Orang and Mazbat celebrated Saraswati puja with great pomp and gaiety on Sunday. From the morning the students, both girls and boys donning their traditional outfits gathered at the respective institutions and celebrated the puja. Small pandals were also put up in some areas, where the people of the locality paid obeisance to the Goddess of Learning. Tangla College also celebrated Saraswati Puja with great enthusiasm. 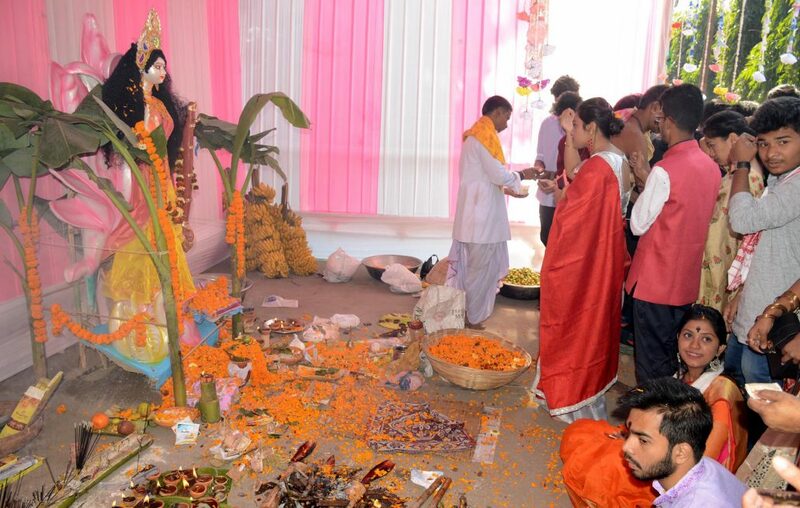 The students’ of the college wearing traditional dresses were seen seeking blessings from goddess Saraswati during the puja. Saraswati idols, brought to the school and college campuses in the previous evening, were worshipped in the morning hours followed by distribution of ‘prasad’. The educational institutions were teeming with students in particular, seeking the blessings of Goddess Saraswati in pursuit of knowledge, art, music and culture. The excitement and enthusiasm of the students’ were deemed by the fact that they enjoyed the day till noon. Our KoKrajhar correspondent adds: Saraswati Puja, the goddess of art, wisdom and culture was also worshipped in different parts of Kokrajhar district by the students’ community. Colourful gates and pandals were put up in different education institutions, clubs where students and devotees were seen thronging and offer their prayers and become a part of the celebration. Students, especially girls in traditional attire like dokhna-jwmgra, mekhla-sador, saris were seen visiting puja pendals and offer prayers. Goddess Sawaswati, depicted as a graceful woman, is seated on a lotus flower with book and veena, a musical instrument, and riding a swan or a peacock.